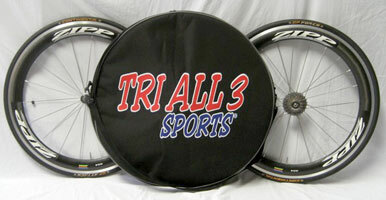 No matter what you ride, or where you ride, TRI ALL 3 SPORTS has a case to protect your valuable investment. 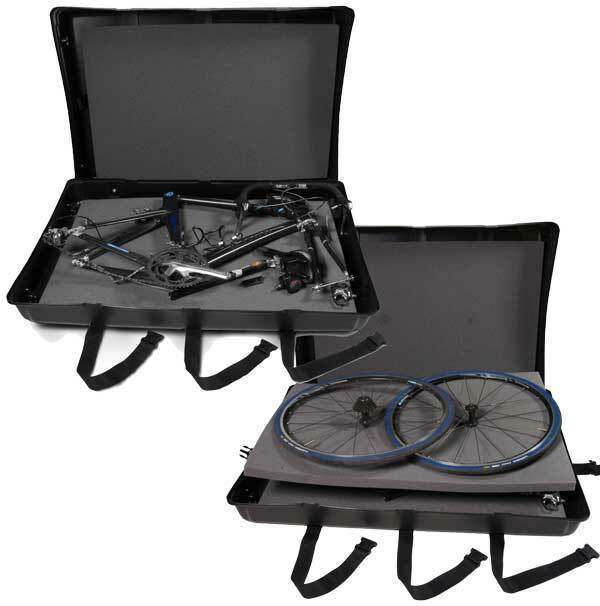 This case is specifically designed for Integrated Seat Post Bikes and other large frames. 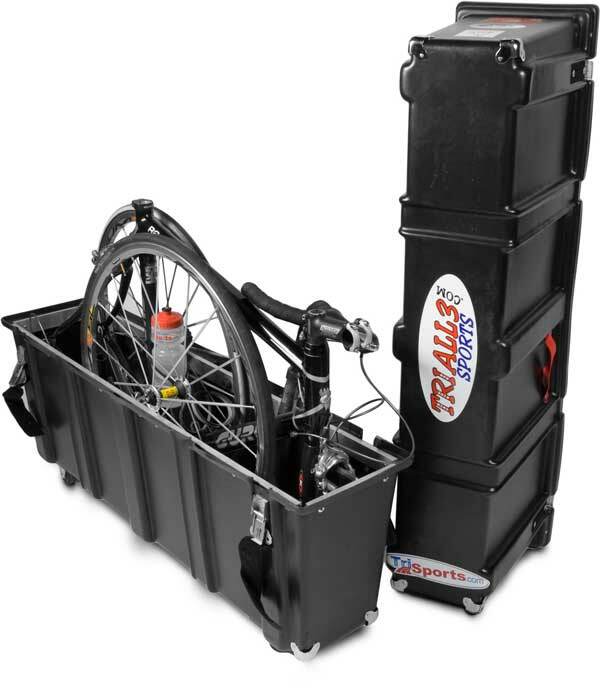 Made of High Molecular Weight Polyethylene and has the same features as out other Pro-Series Bike Cases. Interior measures 47"L x 13"W x 32"H; exterior measures 51"L x 16"W x 39"H (includes casters) and weighs 39 lbs. 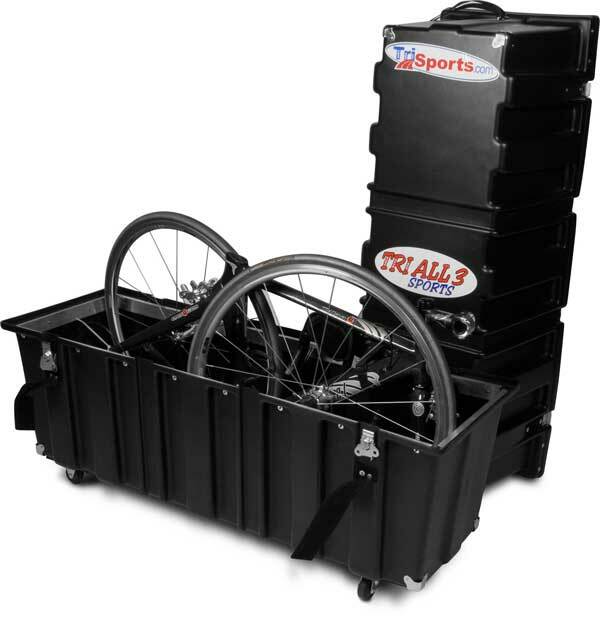 2 bikes, road or mountain (NOT Tandem), made of High Molecular Weight Polyethylene, lockable steel latch system, four heavy-duty casters and two outer straps for extra security. Road or mountain, same features as Original Velo Safe, made of High Molecular Weight Polyethylene. Interior measures 46.5"L x 9.5"W x 26"H; exterior measures 48"L x 12"W x 32"H (includes casters) and weighs only 26 lbs. New Design - Now Even Tougher! 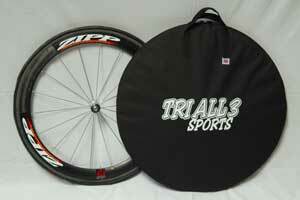 Clam Shell style bike case for road or mountain bike. Will accommodate road bikes up to 58cm. Made of High Molecular Weight Polyethylene, 6 outer straps secure the case. Built-in casters for easy handling. Includes high-density foam padding. Interior measures 45.5"L x 29"W x 10"H. Exterior measures 47"L x 30" W x 11"H and weighs only 26 lbs. 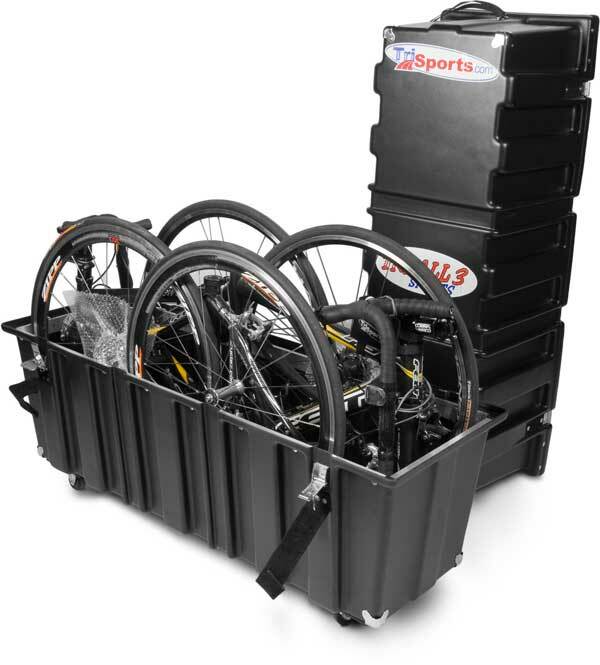 Hard case for 3 wheels, road or mountain, made of High Molecular Weight Polyethylene, with lockable steel latches Used by top triathletes and Olympians worldwide. Exterior measures 34"L x 15.75"W x 28"H. Weighs 10 lbs. New Design - Bigger and Stronger! 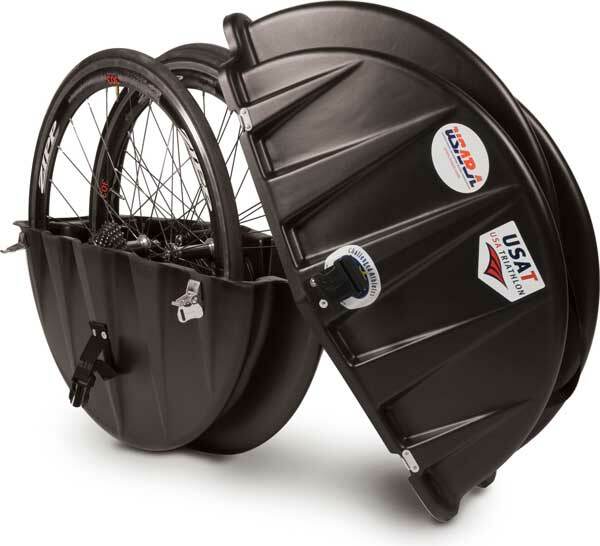 Made of High Molecular Weight Polyethylene to the same high standards as our Olympic-tested Wheel Safe. Designed to carry 2 wheels. Includes high-density foam padding, two outer straps, two Velcro straps and casters for easy handling The case interior measures 28.5"L x 28.5"W 10"H and weighs only 15 lbs. Soft case for 1 racing wheel made of 600 Denier Cordura, high-density foam padding, water resistant, shoulder strap for easy handling, inside pocket for skewer. Great for storing racing wheel or when traveling in a vehicle. Soft case for 2 racing wheels made of 600 Denier Cordura, high-density foam padding, water resistant, shoulder strap for easy handling, inside pocket for skewers. 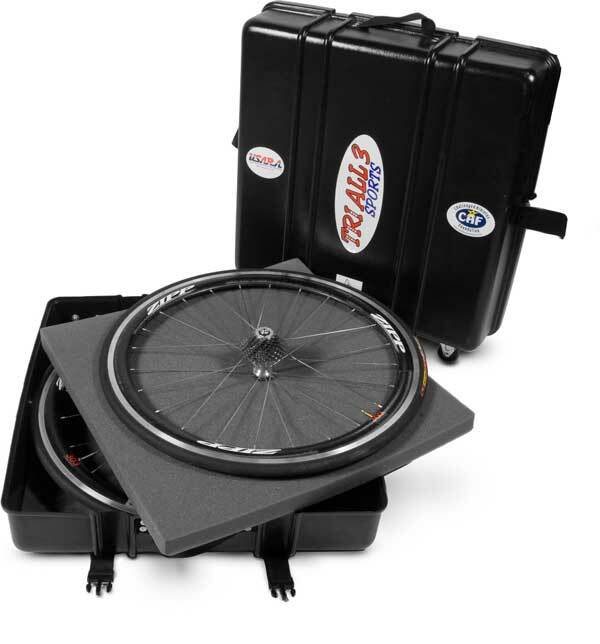 Great for storing racing wheels or when traveling in a vehicle. 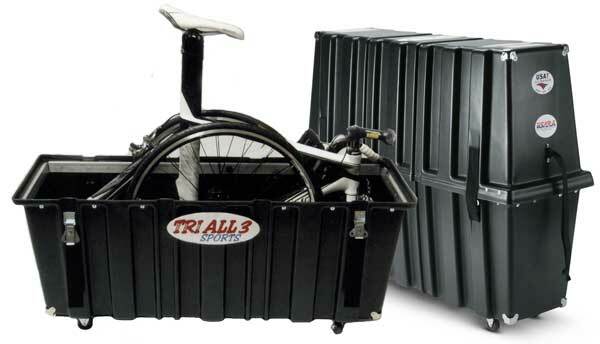 * All product designs, manufacturing technologies and intellectual property are solely owned by TRI ALL 3 SPORTS. ** Due to the major US shipping carriers' new dimensional shipping charges, we highly recommend that you carry your bike case on the plane with you. You will typically save a substantial amount of money, even with the airline fees. TRI ALL 3 SPORTS pricing structure (MSRP) is good only in the continental United States. Because of foreign currency exchange and delivery charges, prices may very around the world. 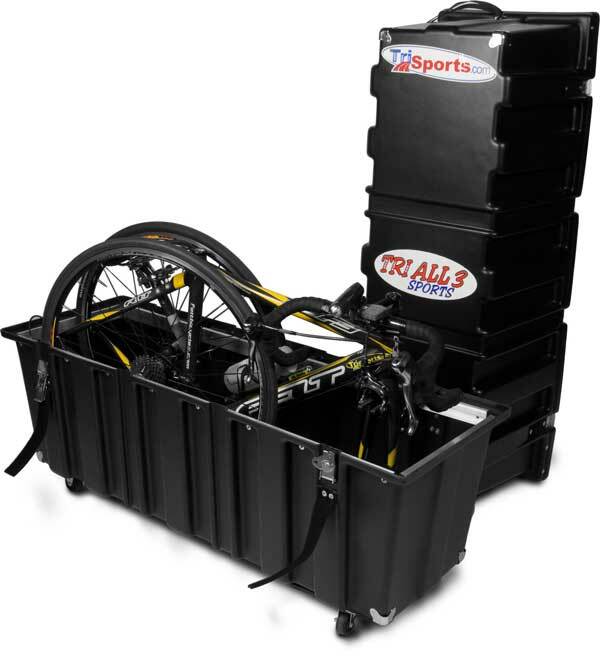 TRI ALL 3 SPORTS is a petroleum based company and due to the fluctuating petroleum cost in the market place, it is effecting our ability to hold our pricing structure and MSRP may change without notice. Please contact TRI ALL 3 SPORTS for the authorized dealer nearest you.